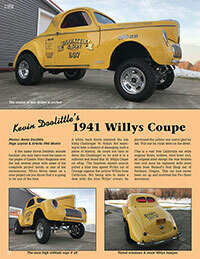 The cover of issue 119 shows Kevin Doolittle's beautiful 1941 Willys Coupe. 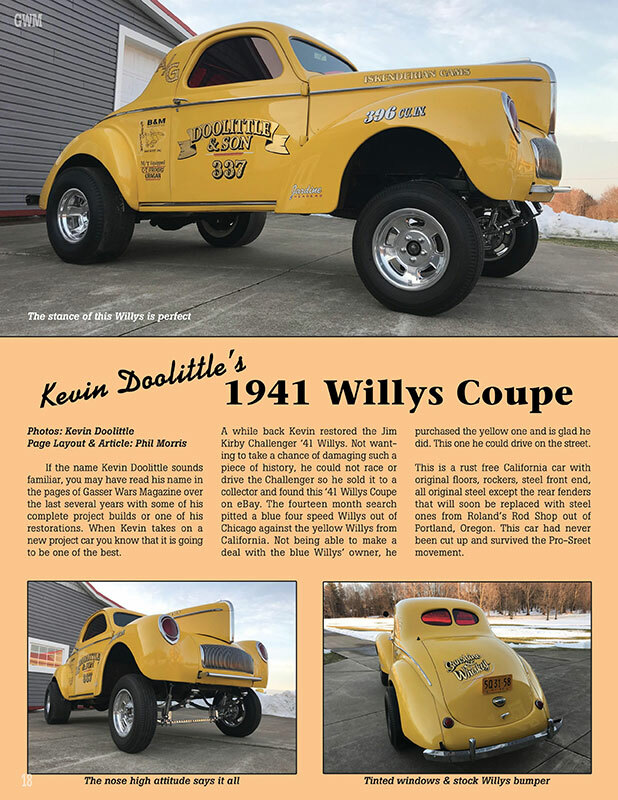 Read four pages about The Doolittle & Son's Willys. 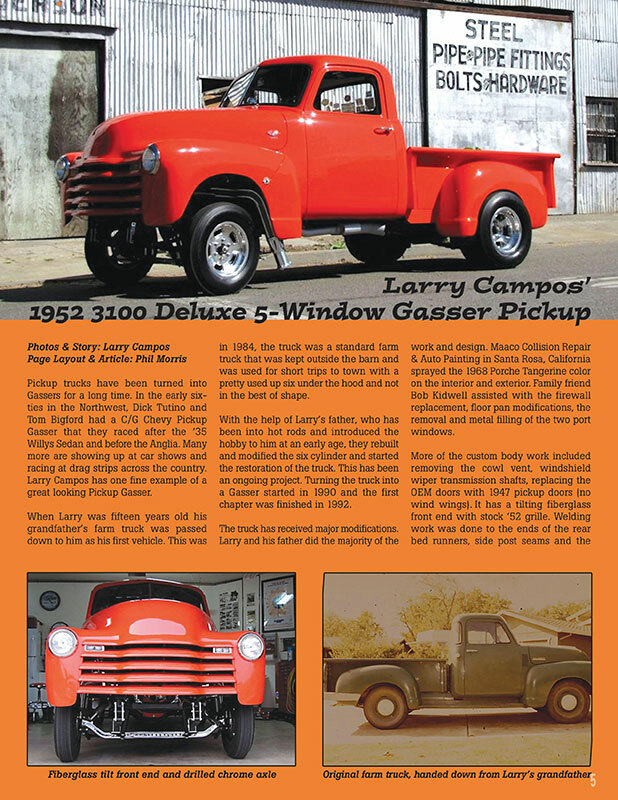 Read about Larry Campos' 1952 3100 Deluxe 5 Window Gasser Truck. 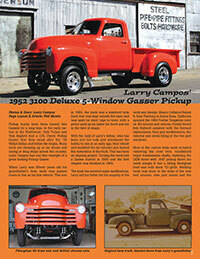 Inside issue read about Dave Milota's 1953 English Ford Popular and Dave’s inspiration for Anglia's. 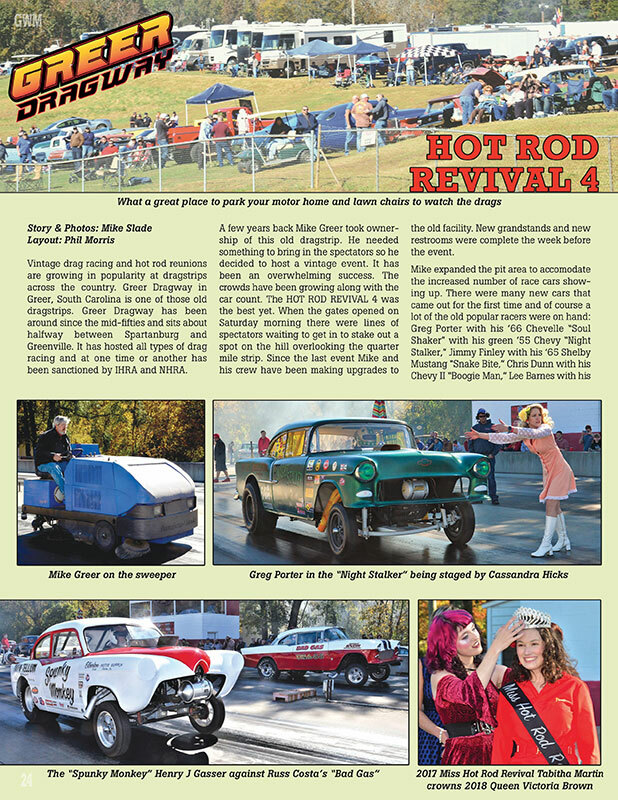 Also 4 pages on Greer's Hot Rod Revival 4. Also Jeff Cryan's tribute to John "Trouble" Cassiol. 119 is jam packed with our regular articles and great advertisers. 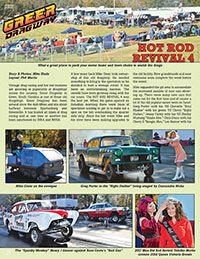 Full story in Issue #119 of Gasser Wars Magazine! Gassers, read about Chevy's, Ford, Anglia's, Willy's, Old's, Austin's, Henry J's, Our 13th year and continuing contributors, Jim Hume, Tom Wilford, Rob Stuart, The Olson's and many more. 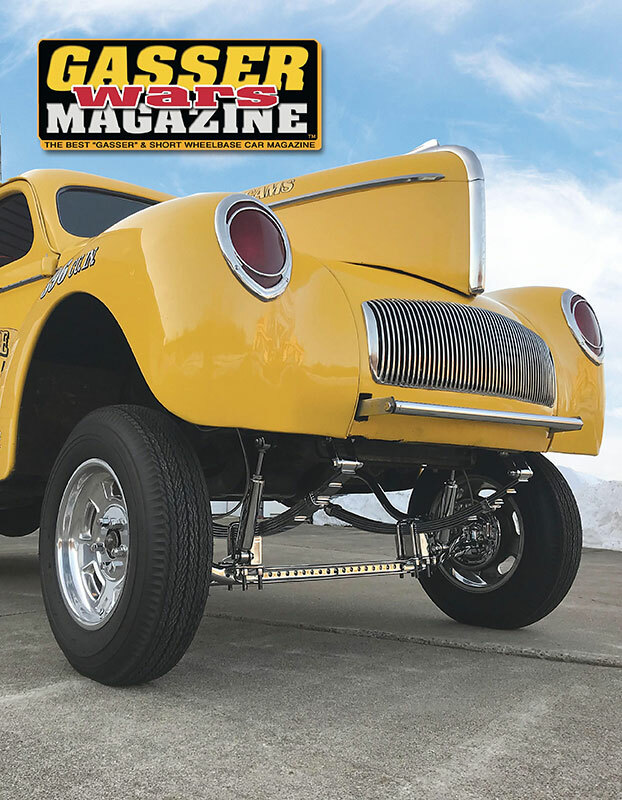 Gasser Wars Magazine has many contributors who regularly send us articles on the latest happenings in our Gasser world. Terry & Cheryl Olson and Dean Kirsten, are experts on Anglias. Terry and Cheryl cover events like the National Hot Rod Reunion, Back to the 50's and the Turkey Run, as well as showcase Anglias that they've built. Deano has a wealth of knowledge when it comes to Anglias, and he shares his knowledge with our readers, giving us tips on restoring Anglias to mint, stock condition. Dean also has a humongus collection of old Anglia photographs, from early Ford promo shots to early drag racing shots. Fantastic! Rob Stuart, of Austin Works, is an expert on Austins. Ask him a question on an Austin and you will get an answer, more than likely along with a joke. Jim Hume of H&H Racecraft, is a genuine, old school craftsman in the field of metal craft. His articles on tin bending give our readers tips on fabricating that help the inexperienced car builder tackle their project. And even those who have been behind the welders mask a time or two will pick up some helpful advice. Tom Willford, aka The Collector, is also a regular. Tom is another avid car guy, who has a collection of car and drag racing memorabilia that could turn the rest of us green with envy. Photographer, Dave Davis, a true gasser guy, has been roaming the country, attending events and searching out the locals. The photos he sends are beautiful and combined with the stories from the car owners, our readers meet some very interesting people and see their beautiful rides. The majority of our magazine is about readers rides. We've had some pretty amazing stories over the years, like the fantastic 8 part series of articles, starting in issue 32, by Gasser Legend Barb Hamilton, the first woman licensed by NHRA to drive a supercharged car. She not only raced and beat the guys, but built her own car and motor. She is absolutely Dee's hero! In issue 55, is Noel Brown shared his radical and beautifully engineered '49 Anglia with us. And how many of you were fans of Bill Drake, with the Ol' Rumble Guts Austin. He sent us a very interesting letter, featured in issue 56, about the end of the track in Utica-Rome, NY in the late 60's. In issue 63, Photographer Dave Davis sent us a story on an incredible Barn Find. Mark Kluge, while gassing up one of his old cars had a woman walk up and tell him her husband had a car like his for sale. Turned out to be a 1940 Willys Deluxe Coupe. Did he buy it?? Then there was the article sent to us by Ron Normann. He has his own "Gasser Wars" going on with his Airoso Brothers '41 Willys Coupe and his Hairy Hauler '41 Willys truck. 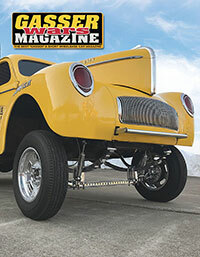 You can read about Ron's Willys in issue 65. I could go on and on, because these are just a few of the 100's of great stories in the pages of Gasser Wars Magazine. You will love the stories, and you can't beat the photography. One thing is for sure though... we've got you covered! You won't want to miss any of the action!